The different types of emulation header connectors are shown here, as well as information on connecting development tools to the header. 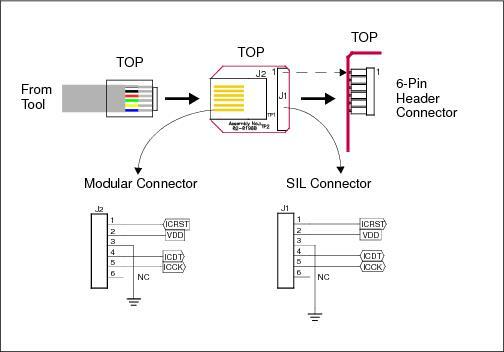 Emulation headers with 6-pin SIL (Single In-Line) connectors are compatible with the PICkit 3. The 6-pin modular cable attached to the Standard Driver Board may be connected to the 6 header pins through the Modular-to-SIL Adapter.